Northern Cardinal. 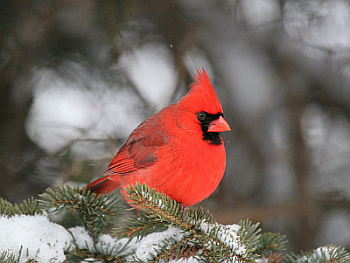 Learn all about Northern Cardinals! ■ Only a few female North American songbirds sing, but the female Northern Cardinal does, and often while sitting on the nest. ■ Cardinals attack their own reflection in spring and early summer. Within a few weeks, aggression hormone levels begin to subside and these attacks should end. One female Cardinal kept up this behavior every day or so for six months without stopping. ■ The Northern Cardinal is the state bird of seven states. ■ The oldest recorded Northern Cardinal was 15 years 9 months old. ■ Nearly any bird feeder you put out ought to attract Northern Cardinals, but they particularly seem to use sunflower seeds. Leave undergrowth in your backyard or around the edges, and you may have cardinals nesting on your property.